Stampin' Up! Retiring Accessories - LIVE LIST: This is whats left!! | Midnight Crafting Midnight Crafting: Stampin' Up! Retiring Accessories - LIVE LIST: This is whats left!! Stampin' Up! Retiring Accessories - LIVE LIST: This is whats left!! 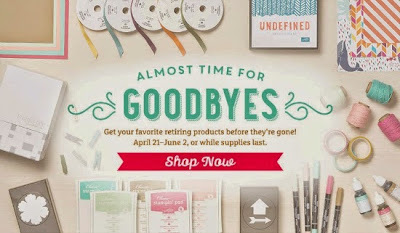 The end of this catalog quickly approaches!! Have you gotten your favorites? Is your Wish List cleared up, and ready to get into the new catalog? You only have until JUNE 2nd to order these RETIRING STAMP SETS. Order Early for BEST selection, items are available as supplies last. This is a live link - these are the items available right now in the store!! CLICK ON THE ITEM you're interested in. Remember! Once they're gone, you'll have to pony up on eBay and pay top dollar! Get your favorites now - some up to 50% off!! **HIGH Sell-out PROBABILITY, many items already are unavailable.